Organic tulips are not new in the Dutch tulip industry. 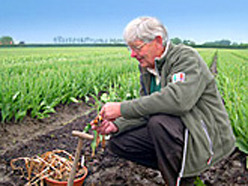 Our grower Wilbrord Braakman grows already for 18 years 100% organic tulips! In America they aren't wide available yet because most companies aren't interested in dealing with small organic growers like Wilbord. EcoTulips isn't interested in quantity; we go for environmental friendly and quality we don't sell millions of tulips. We want to give you the opportunity to know how and where the tulips are grown. And feel good about the fact that they are grown with respect for nature and environment!